The AAS300 is a 3 way active antenna splitter with excellent specifications (like isolation of 70dB!) between the outputs. No extra power supply is necessary, because it’s USB powered– no switching, no buttons. The physical size is exactly like the Bonito RadioJet IF Receiver. It was one of the most popular devices at the Friedrichshafen show and we already have many preorders. The device is fully made here in Germany. We are starting now to resell it. 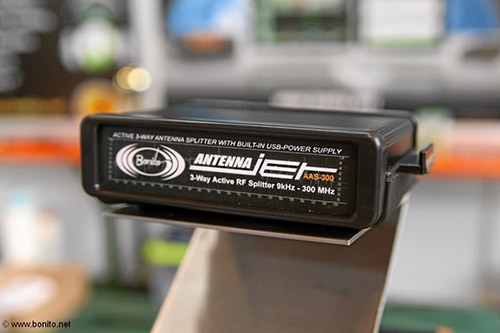 If you would like to read more about the new AntennaJet AAS300, click here for specs on Bonito’s site. This is certainly a device I will consider purchasing. I tend to use one large multi-band delta loop for all of my receivers. I often record broadcasts on one receiver and wish that I could band-scan with the same antenna on another receiver. The AAS300 would make for a simple solution. Dennis tells me that the AAS300 will be available through North American retailers and global distributors that currently carry the Bonito RadioJet. This entry was posted in Manufacturers, New Products, News, Retailers, Shortwave Radio and tagged AAS300, Antenna Splitter, Bonito, Bonito Antenna Splitter, Bonito AntennaJet, Bonito AntennaJet AAS300, HF Antenna Sharing, HF Antenna Splitter, Shortwave Antenna Splitter on July 26, 2013 by Thomas. You still compare the wrong Products! Look only at the Values of the Stridberg:”500 kHz to 50 MHz – 4 Ports” still no 9 kHz to 300MHz!!! To cover nearly a similar Frequencyrange, you need to buy 3 different products from them. You have to pay 3x 185 US$ = 555,-US$. And then you will still have no VLW or LW and of course not the isolation values as on the AntennaJet. Which one is now cheaper? I think this is for SWL’s like me with a RadioJet, Excalibur , Winradio G315 and so on. I also have a TenTec 320 for expample and it needs exactly 50Ohms. If not the beast is totally noisy. With the AntennaJet I have no Problem. I think it is a real good product for an exeptable price, but it’s maybe not for your requirements. But I think most of the SDR Users will love it. Agree with all of that, but for the price, the average user isn’t going to notice any of those little things, (and the figures produced don’t back that up anway. Incidentally I spoke to Bonito support who agreed with my findings so its not just my view here) so what market is it aimed at? There are a lot of splitters on the market that offer the same type of performance for a lot less, a quick Google shows the CCW splitter or the stridberg range which are 4 or 5 to one for less price ? I cant see why the high price for what’s in the certified aluminium box …. its really nothing new and a few dollars components as far as I can see,,,, unless you can tell us different ? Happy to be proven wrong and say its worth the dollars, and if it is great .. if not then ?? 1. The AntennaJet is starting with 9KHz instead of 500KHz (MW), which means that LF & VLF are already included. 2. 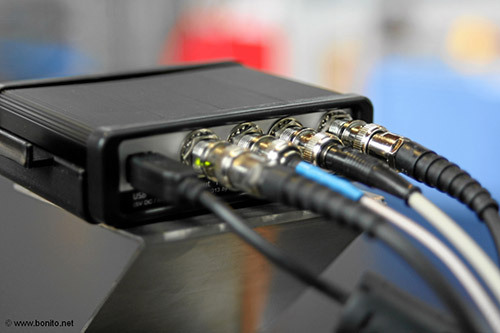 Standard active antenna splitter designs are consisting of one amplifier followed by a splitter network. The amplifier has to compensate the losses of the following splitter network. The AntennaJet`s design is more complex and consists of three different independant amplifiers with about 0dB gain and high reverse isolation. 3. The AntennaJet has an additional ESD protection implemented which could avoid demages of the connected devices. No doubt it does as stated, the the high DB loss is at the very lowest bands supported, and for that price why would I not go for a proven splitter, such as a stridberg or even cheaper CCW splitter. Very expensive for what it is? , I think the ccw is 4 or 5 outputs?